Voodoo is an animist religion that consecrates a cult to Loas (gods) and to the ancestors—the cult of ancestors constitutes a system of religious beliefs and rites which are used principally to reinforce the social system as well as the dependence of the family—and at the same time, voodoo spirits, guardians, deities, or forces of nature. 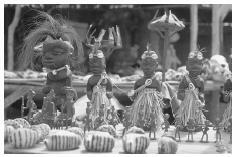 Voodoo originated in Africa, specifically with the Fon, Yoruba, and Ewe tribes. Geographically, those ethnic groups can be found throughout Ghana, Togo, Benin, and Nigeria. More than a religion or a cult of death, voodoo plays a major role in everyday life through the symbolization of the African traditions for the Haitian people. Voodoo is far from a uniform worship, but evolved differently from one region to the next. Voodooism is invested throughout Africa as evidenced by these voodoo dolls on display at a marketplace in Lome, Togo. Voodoo is more than a synthesis of different African beliefs because it incorporates significant influences from Christianity. The word voodoo comes from the Fon language, spoken in Benin, meaning "a kind of power which is mysterious and, at the same time, fearsome." Voodoo is invested in all parts of Haitian life and has a considerable influence on each person and on each natural element. The voodoo pantheon consists of many Loas, which are generally associated with a Catholic saint. Despite the existence of these Loas, voodoo is essentially monotheist; in their conception, the Loas are neither more or less than the intermediaries between God and the human ones. The cult of voodoo appeared in the New World with the African slave trade, which began in Haiti during the 1700s. The slaves brought with them these African traditions. There are also some variations of this cult in Brasilia and in Islands of Antigua. Voodoo involves a mix of different ethnic beliefs and it rapidly became an important element of cultural cohesion for the slaves, who came from different cultures and used different languages. According to the tradition of voodoo, humans enter into communication with the Loas in a very ritualized manner. The Loas are capricious and they will only be of help if one comes into contact with them correctly through the elaboration of different rituals (according to the Loas one wishes to contact). The voodoo service takes place in the oúfo (voodoo temple) and this ritual must be officiated by a hougan (priest) or a mambo (priestess). Voodoo adherents attribute illnesses and deaths to the wrath of angry ancestors—hence, the considerable importance given to the ritual and appeasement ceremony. The voodoo ceremony embraces several elements, including music, dance, food offering, drumming, and animal sacrifices. The ritual Rada, which is used in the initiation rite, involves the "Good Loas" who have come from Africa, and who represent the lost mystic world. Inside the voodoo ceremony, the Rada Loas are the first to be served; they represent the guardians of custom and tradition. The Rada Loas play an important function through the different healing processes and their principal characteristic is the fact that all of their actions are directed toward good. In opposition, the ritual Petro involves "Bad Loas," which originated in Haiti. The Petro Loas are considered to be the masters of magic. They embody a kind of relentless force. As the ethnologist Alfred Métraux describes, "the word Petro inescapably conjures up visions of implacable force of roughness and even ferocity" (1972). The Rada and Petro rituals use both defensive and offensive magic, and can help to obtain justice for someone who has been wronged. The ritual of possession, which appears in the Petro ritual, constitutes the most important way to connect the spirits or ancestors with human beings. A possession crisis appears when the voodoo practitioner is in a situation of marriage with a Loa and becomes his "horse." The possessed person suffers from amnesia, which is explained by the fact that no one can be at the same time god and human. This possession crisis generally appears in a ceremony called Manger-Loa and constitutes the major happening in the voodoo ceremony. The voodoo conceptualization of the world involves the belief in continuity between life and death. In voodoo, death is perceived as a regeneration of all society if the various death rituals and the burial services are well executed. Also, considerable importance is attributed to dead persons and the regular maintenance of the tomb. Thus the cult of voodoo succeeds in attaining a reconciliation between the world of the alive and the world of the dead. Davis, Wade. The Serpent and the Rainbow. New York: Simon & Schuster, 1985. Derem, Maya. Divine Horsemen: The Living Gods of Haiti. 1953. Reprint, New Paltz, NY: McPherson, 1983. Métraux, Alfred. Voodoo in Haiti. New York: Schrocken, 1972. Why is the death so important in the Ewe tribe and others? Apparently after someone dies they make puppets for them and feed those and so on? Why is this like that, are they scared or is this because of superstition, or belief? What's the background? Myths? This is really interesting. Tell me more about it. I just wanted to share some information: I had received my voodoo charm in the mail and it work alot like orgone energy or self healing, ( but ) ~ I also take aluminium for my health. Things that you had never believed ( _in_ ) change with the wind and so does death also. Well, all I can say is: never stop learning and never give-up because you never know!